Local communities need to see the implementation of new farming techniques in order to adopt them. Many health, social, environmental and economic benefits of buying and eating local produce are currently being overseen by Vincentians. 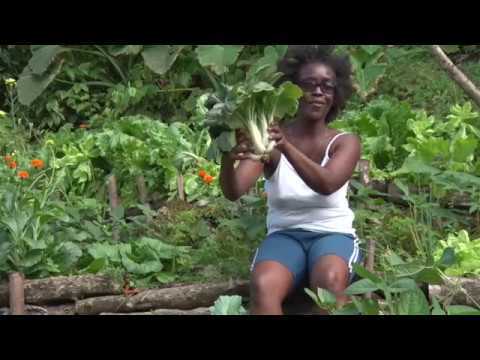 A few decades ago the people in SVG fed themselves with a variety of organic foods. Today, the country imports US$40 million worth of food a year, farmers use imported chemicals and the population can no longer feed itself. St. Vincent relies heavily on agriculture for rural livelihood and development. However, local agricultural systems are affected by land degradation and climate change, which threaten food production. Furthermore, globalisation has forced the control of the nation’s agricultural production on to foreign food corporations. The corporations hire well-connected professional advocates, often lawyers, to argue or lobby for specific legislation in decision-making bodies; - that influence politics and public opinion. Corporate lobbyists change food standards, approve of pesticides and promote Genetically Modified seeds. 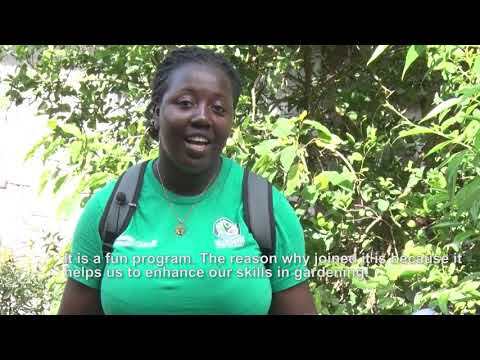 In order to relearn and share more sustainable ways of life, students and teachers continued doing investigation activities in several farms around Saint Vincent and in other academic and audiovisual resources. They also started testing and implementing many sustainable actions. For this reason, from 2012 to 2016 the use of chemicals at RVA was gradually stopped and the agricultural practices changed dramatically. The farm produces food that contributes to the 29.000 meals consumed in the school per year. Community networks of local farmers have been established to provide RVA with food that is not being produced or grown yet. Such as staples, fish, coconut oil and specific vegetables. Imported food brought to the kitchen has been reduced items such as dairy, coffee, rice, pasta and some spices. The intensive vegetable garden is based on Permaculture principles, which view the garden as an ecosystem and use a holistic system approach management. A main source of fertility of the intensive garden at RVA comes from it’s compost production. Compost is made by placing layers of nitrogenous (green) organic matter - such as kitchen waste and horse manure - with carbon based (brown) organic matter - such as dried plant material and cardboard - into a pile. This layer combination provides the diet required by soil microbes to rapidly decompose the organic matter in the pile. At the end of the process, a high-quality compost is produced and provides an excellent fertiliser for hungry fruits and vegetables. The teams have experimented with various compost systems over the years. Currently, there is a system comprising eight compost piles that are hand turned every week. These labour intensive piles, made up of fresh green leaves, dry brown leaves, kitchen waste, cardboard and horse manure; produce close to a cubic meter of compost per week. Efforts have been made to find more labour efficient ways to produce a higher volume and better quality compost. For this reason, in the future, probiotic or efficient microbes will be introduced to the mix, to enhance the composting process. Biochar is an excellent soil enhancer and carbon sequester. It’s structure helps the soil keep its moisture and thereby its capacity to hold nutrients. Another benefit of applying biochar to the soil is carbon storage. The carbon in the biochar can stay stable for hundreds or thousand of years and thereby contributes to a meaningful carbon sequestration. At the school, several experiments have been made to find the best way to make biochar. In 2016, a kiln was created, where the wood gas (pyrolysis gas) from the char chamber goes back to the fire underneath the char chamber, so more wood gas can be released and the charring process can go faster. Even though the insulation system still needs to be worked on, this kiln design has proven to be quite efficient. It provides the garden with a weekly production of biochar. Soft rotten wood, dry leaves and grass clippings are mixed with horse manure and biochar. This mixture is then applied to the top of the garden beds as mulch; to reduce soil erosion, control weeds and increase water retention. The mulch, itself in time becomes fertiliser, as it is transformed into rich humus by the soil microbes. Every week, the mulch layer in the garden beds are maintained by the students and teachers. Making lasagna garden beds is a method that results in a rich soil with less work required. Several beds in the garden are lasagna beds. The name “lasagna bed” has nothing to do with what you’ll be growing in the garden. It refers to the method of building the garden beds, which is, essentially, adding layers of organic materials that “cooks down” over time, resulting in rich, fluffy soil that will help your plants thrive. The lasagna bed, mulch and compost systems require a lot of organic material. For this reason, support species are grown in and around the intensive garden. Support species are trees and veining beans that are capable of fixing nitrogen from the atmosphere. They release nitrogen from the nodules on their roots into the soil to benefit surrounding plants. The organic matter, deriving from them, is also noted for its high nitrogen content. Therefore, these plants provide the soil with additional nitrogen value when they are pruned and their cuttings are used in mulch and compost. Another example of support species is Vetiver Grass, which is used for erosion control as well as for mulch and material for composting. Banana plants, Neem, Gliricidia and Moringa trees have been planted around the garden to provide filtered light into the garden and to hold moisture. This dispersed shade system (DSS) is an important part of the garden as it lowers the ambient temperature in the understory, creating an environment more conducive to the planting of vegetables; particularly during the hot dry months of March and April. Plants are positioned on the garden beds according to their respective plant families. In this way, by mixing plant families, the nutrient and fertiliser requirements of the diverse plant families are naturally produced and therefore more easily met; than when growing a mono crop. In addition, RVA students experiment with liquid fertilisers - most commonly in the form of compost tea, nettle tea, moringa tea and the liquid effluent from the biogas digester. They are applied weekly, either as a foliar spray or directly to the root of the plants. A Permaculture garden is an array of colors and shapes that hold a diversity of plant families and species. Some plants are specifically placed to attract beneficial insects whilst others have been planted to repel pests affecting nearby vegetables. Due to this design, the garden suffers minimal damage by pests. When an outbreak does occur, students implement various organic pest control solutions. Neem, garlic, hot pepper and bacillus thuringus (Bt) solutions are typically applied as a liquid spray. In the garden several different species are planted together in the same bed, according to their ability to coexist and benefit from each other. This biodiversity is important in sustaining the health of the intensive vegetable garden and the garden’s ecosystem. Areas with higher levels of biodiversity are able to adjust to changes in the climate and to prevent diseases. Polyculture is a more practical and economical way to grow food than monoculture. In the Academy’s edible forest garden - fruits, nuts, vegetables, herbs and other useful herbs - are put together in various patterns that forge symbiotic relationships which mimic natural and rich ecosystems. RVA’s two acre forest garden presently has 870 food trees and plants. The garden has been in development during a couple of years and is becoming a beautiful, diverse and high-yield garden. Team participants and teachers are learning to design a more self-maintaining system by understanding other ecosystems better. Canopy, shrubs, bushes, flowers, ground cover, root crops and climbing layers have been planted and some of the species currently growing in the Forest Garden are: Mango, Moringa, Banana, Fig, Coffee, Gliricidia, Guava, Lime, Moringa, three varieties of Papaya, Pomegranate, Sugar Apple, Sweetsop, Tamarind, Barbados Cherry and Golden Apple, Sour Orange, Tangerine, Cashew Nut, Carambola, Cassava, Tania, Mulberries and Pigeon Peas, Physic Nut, Marigold, Patchouli, Cowpeas, Passion fruit, Vanilla and Loofah, Lemongrass, Vetiver (Khus-Khus Grass), Sugar Cane, Tumeric, Cassava, Tania and Coconut. More than ever, it can be argued that, with an ever growing human population, biodiversity is crucial to maintaining life and the earth’s balance and temperature. Biodiversity is the diversity of life, it’s the rich variety of life forms on our beautiful planet. Using and storing heirloom seeds: In the nineties, the ten biggest seed companies controlled less than 30% of the market. Today, the three largest companies control more than 50% and they are also the major pesticide producers. Seeds are becoming more expensive and with fewer varieties. From the beginning of this century, the variety of corn types has been reduced from 300 to 12 and cabbage from 540 to 28. In the same time period, 97% of the vegetable varieties that existed - around 1.900 - have become extinct and are thus impossible to recover. Genetically modified (GMO) seeds only work “once”. This means that they cannot be replanted; they are corrupted. Furthermore, most seeds used in St. Vincent are imported Hybrid seeds that also do not germinate after the first harvest. To become self-sufficient with seeds the Academy decided to produce and store its own organic heirloom seeds. One of the greenhouses has been designated solely for seed production and it currently has eggplant, cabbage, carrot, lettuce and beans. The seeds are stored in an “organic only” fridge and are carefully inventoried. Additionally, to bring awareness about what GMO seeds are and the reasons why the public should be concerned about using them; several information campaigns have been made in schools, community events, radio interviews and through handouts of the RVA climate newspaper. To generate income, the school grows and processes Passion fruit, on five acres of land. Once harvested, the Passion Fruit is processed into concentrated juice and is sold fresh and as pulp. Annually, 100.000 passion fruits are produced, which is made into 10.000 lbs of pulp. The Passion Fruit production employs 5 people and juice and pulp to supermarkets and hotels around St. Vincent and the Grenadines. In 2015, the passion fruit production became chemical free. This outcome was achieved by removing the need to use herbicides and chemical fertilizers between the passion rows. Now, a weed wacker is used to remove grass and weeds. The second (and on-going challenge) is ensuring the farm’s movement from a mono-cultural enterprise to a multicultural one by introducing alternative and compatible fruit crops to grow in between the passion fruit. In 2015, the use of herbicides and pesticides on the bananas stopped. The acres with chemical crops were cut down and relocated to an acre organic banana experimental area. This field is now mixed with gliricidia trees, which are regularly pruned to produce mulch. The small field is already producing beautiful bunches of bananas. The next phase of this experiment is to add cacao trees and vanilla so the field has more biodiversity and the school can benefit from these products as well. We have chicken for egg production, sheep and pigs for meat production. The two hundred chickens live in a one acre free range system with different pastures to feed on between meals of imported chicken feed. The pig production is in the forest garden and the pigs are mainly fed kitchen waste and various fruits and greens from the forest garden. In July one male and four female sheep moved into the old banana field that has by now been transformed into 4 fields. The sheep will eat locally produced organic grass. Pigs and sheep are slaughtered on site and the production is aimed to provide the school with sustainable mostly organic, locally produced proteins. The school is in the process of utilizing the chicken, sheep and pig manure more effectively with a compost system that will provide the passion fruit fields with organic matter and growing medium for the tree nursery. Furthermore, as some of the animals are still dependent on imported feed, explorations are being made on how to produce chicken feed internally. We also have seven horses that are used for lessons, leisure and compost production. The horses live in a free range natural horse management system with partly Silvopastural system which is perhaps the oldest agroforestry system used in the temperate regions of the world. Silvopastoral systems are characterized by integrating trees with forage and livestock production. Such systems have the potential to increase agricultural production in the long term.